The Running Rail Replacement Project continues with work near Main Street–Science World Station is starting April 2. Work will not be done on Fridays and Saturdays and is weather dependent. From 9:30pm until the end of service, Expo Line trains will be single tracking – when trains travel on the same track in alternating directions – between Main Street-Science World and Commercial-Broadway stations. Expo Line trains will operate between Waterfront to King George Station. Please be aware that during this work, there will be no Expo Line trains to Production Way–University. There will be a shuttle train operating between New Westminster and VCC–Clark. 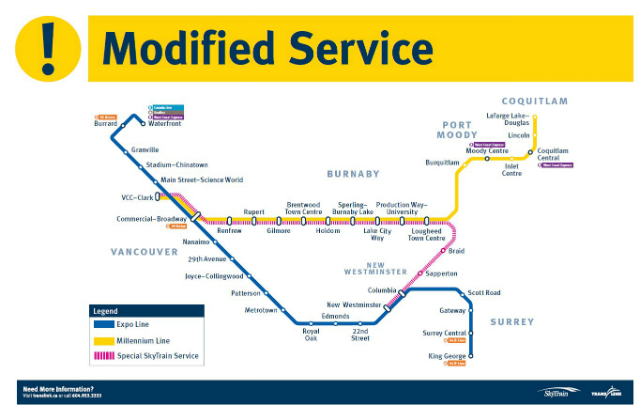 You can change trains to this service at New Westminster and Columbia stations. If you are travelling on the Expo Line, please allow for 15-20 minutes extra travel time. Millennium Line and Canada Line will operate normally. If you are travelling from downtown Vancouver and your destination is Sapperton, Braid, Lougheed Town Centre or Production Way–University stations, take an Expo Line train to Commercial–Broadway station and change trains to a VCC–Clark – New Westminster train operating from platform 2. If you are travelling from Commercial–Broadway to Braid, Sapperton, Columbia or New Westminster stations, board a VCC–Clark – New Westminster train operating from platform 2. If you are travelling from New Westminster Station to a destination along the Millennium Line, including Commercial–Broadway Station, take the New Westminster – VCC–Clark train. If you are travelling from Surrey to a destination along the Millennium Line, including Commercial–Broadway Station, ride the Expo Line to Columbia and transfer to a New Westminster – VCC–Clark train. If you are travelling on the Millennium Line Evergreen Extension to New Westminster Station or beyond, transfer at Lougheed Town Centre as you normally would and catch the VCC–Clark – New Westminster train from Platform 2 at Lougheed Town Centre. If required, change to the Expo Line at New Westminster to continue west. Sunday April 2: Service change delayed one hour, beginning at 10:30pm, to accommodate the Canucks hockey game. Wednesday April 5: Service change delayed one hour, beginning at 10:30pm, to accommodate the Canucks hockey game. Thank you for your patience during this necessary maintenance to our SkyTrain system. For more information on what this means for your commute, visit translink.ca/alerts. Find details on the Rail Replacement Project at translink.ca/rail replacement. 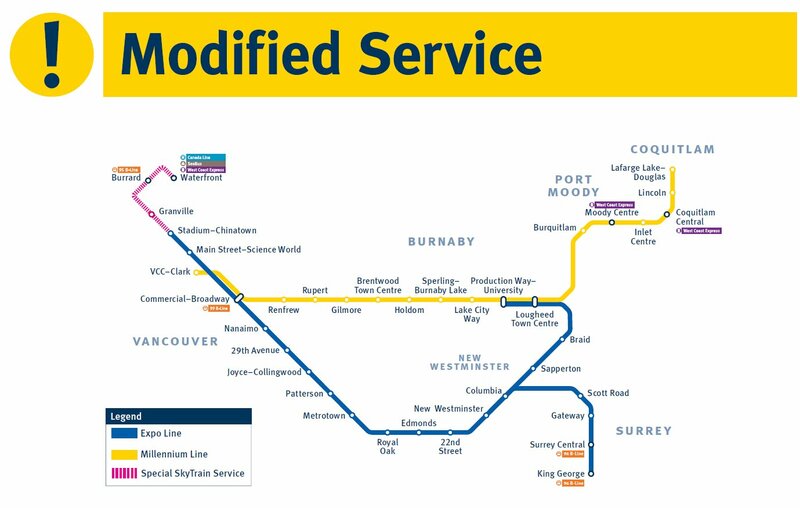 As part of keeping our system in a state of good repair, we are replacing 5,000 linear metres of running rail at four main locations close to Metrotown, Main Street–Science World, Stadium–Chinatown and Waterfront stations. The next area of running rail replacement is near Stadium–Chinatown Station and is taking place from today, February 23 to March 9 16 22. Work will not be done on Fridays and Saturdays and is weather dependent. Customers can expect modified service between Waterfront and Stadium–Chinatown stations during the specific work times. A Special SkyTrain Service shuttle will provide 10 minute service in both directions between Waterfront and Stadium–Chinatown stations. From 9:30 p.m. until the end of service, Expo Line trains travelling towards Waterfront will terminate at Stadium–Chinatown station. Expo Line trains travelling towards both King George and Production Way-University will operate normally from Stadium–Chinatown stations. Expo Line passengers connecting at Stadium–Chinatown should allow for 5-10 minutes of extra travel time. Millennium Line and Canada Line will operate normally. Tuesday, February 28: service change delayed one hour, beginning at 10:30 p.m., to accommodate the Canucks game. Thursday, March 2: service change delayed one hour, beginning at 10:30 p.m., to accommodate the Canucks game. Sunday, Mar. 5: service change delayed one hour, beginning at 10:30 p.m., to accommodate the Whitecaps game. Tuesday, Mar. 7: service change delayed one hour, beginning at 10:30 p.m., to accommodate the Canucks game. Thursday, Mar. 9: service change delayed one hour, beginning at 10:30 p.m., to accommodate the Canucks game. Monday, Mar. 13: service change delayed one hour, beginning at 10:30 p.m., to accommodate the Canucks game. Tuesday, Mar. 14: No work will take place on this date. Thursday, Mar. 16: service change delayed one hour, beginning at 10:30 p.m., to accommodate the Canucks game. Riders should also be sure to watch destination displays and listen for train destination announcements. How does this affect your commute? Check out our Alerts Page for pattern changes and upcoming work. Find more information on the entire project, visit translink.ca/railreplacement.